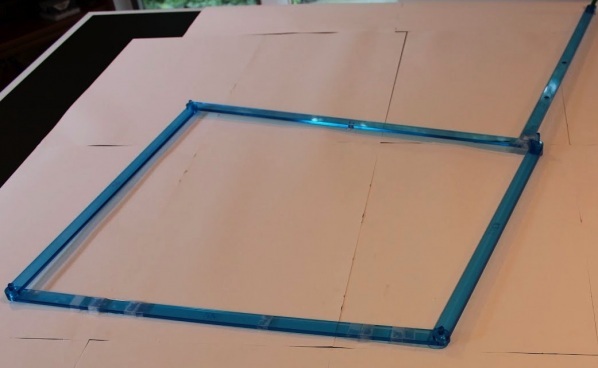 Math Monday: Linkages, Part 4 — Four Bars, More Positions? 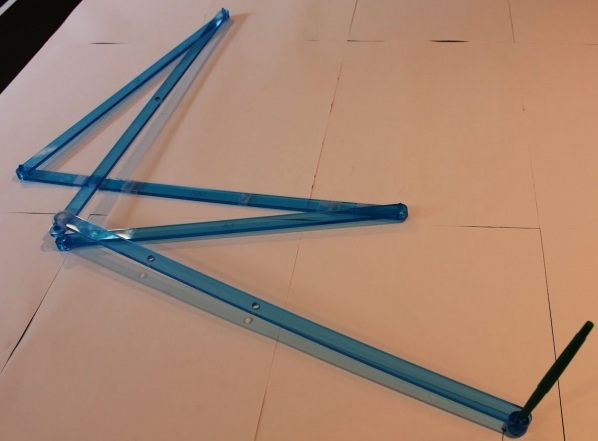 In this column, we will wrap up our close look at four-bar linkages. 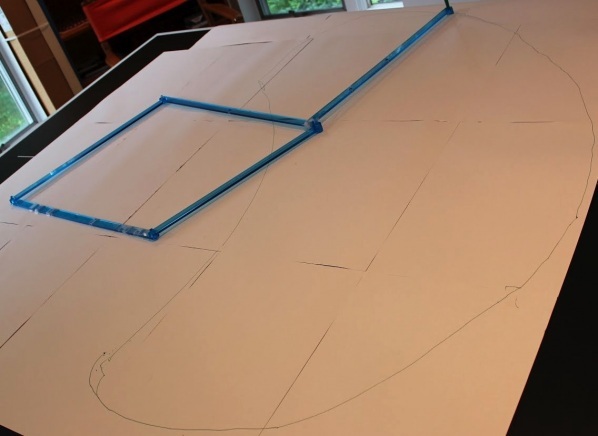 See the Linkages series introduction for the MoMath Linkage Kit, an introduction, and general instructions. Given how difficult it was to construct a linkage that caused one bar to take on four desired positions, we must be at the limit, right? Actually, no. If you happened to read the “fine print” details of the construction that found the endpoints of the fixed bar of the linkage, you might have noticed that there is one step in which an arbitrary point is chosen. Thus, there is actually an infinite family of four-bar linkages that would produce the same “M” positions we created last time. That suggests, and it is in fact the case, that there is enough flexibility to achieve any five prescribed positions. The constructions get pretty hairy, so we will just build an example that’s already been worked out. 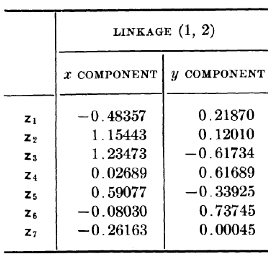 Our friends Hartenberg & Danavit [PDF] wanted to construct a linkage that would pass through these positions: And here’s what they came up with for the x and y dimensions of each of the necessary bars (z1, z4, z5, and z6 in their notation; z2, z3, and z4 are auxiliary dimensions): Let’s check their work, shall we? You need a big table for this one, to get reasonable accuracy on these specifications with all links an integer multiple of 3/8?. Ingredients: A 55-bar (A), 50-bar (B), 60-bar (C), and 43-bar (D); an extra 60-bar (E); and four linkers. Directions: Link A to B to C to D, and then affix the extra 60-bar E at right angles to C. The extra bar E should be at right angles C, as close as possible to the joint with D and extending as far away from A as possible. Your linkage should look like this: To use: Fix A horizontally with a slight downward slope to the right, and rotate B a full rotation. The extra bar E will proceed through all five of the positions specified. You can put a pen in the far end of E to trace out the curve, if you like. Here is a snapshot partway through, corresponding basically to the position labeled “C2? 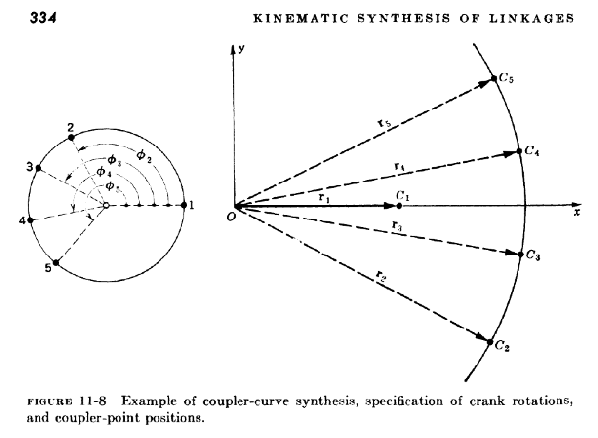 in the original diagram: And here’s the complete curve: Looks like Hartenberg and Danavit did their homework. And now we’ve reached the limit: there is not, in general, a four-bar linkage that can achieve six prescribed locations for one bar. So next time we’ll start looking at some more complex linkages. This article first appeared on Make: Online, September 10, 2012.